You will love this gulet because of its spaciousness and simplicity. On the back deck which can be covered by tent is table surrounded on one side by the bench and on the other by comfortable red chairs. Behind him is a leisure sofa, and on the other deck is shower and mattresses for sunbathing. The large lounge has a bar, TV and Wi-Fi. 6 air-conditioned cabins with en suite bathrooms can accommodate up to 14 people. If you are more adventurous type, you have the opportunity to try water skiing, canoeing, snorkeling and fishing. 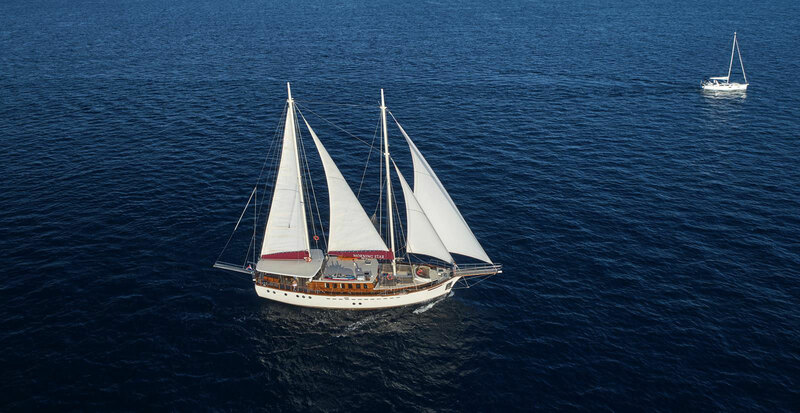 A specialty of this gulet is that you will feel the safest as possible: crew has maritime and nautical education and its expertise will contribute to your comfort. And with their warmth and communication skills, you will feel just like a star. Lucky you!